Worwetz Energy Systems includes only new, fresh batteries. 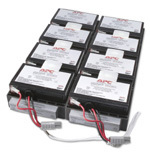 We are proud to supply the same battery brand selected by APC - CSB. For larger 3-phase systems the HRL, High Rate Long Duration are prefered, as well as FR Flame retardent series for rugged application. Swap & return battery cases for recycling.